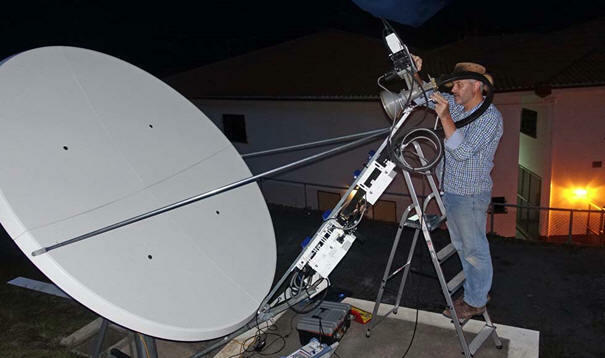 ND SatCom is supporting Dr. Klaus-Dieter John of Diospi Suyana in Peru with SKYWAN satellite network recently delivered, which is now ready for installation and commissioning by the local satellite communication specialist Chris Welch. Through strong personal commitment, generous donors, and the support of the Peruvian government, Dr. John has built in a rural impoverished region a comprehensive health and education center consisting of a modern hospital, dental and eye clinic, children’s club facilities, and the Diospi Suyana School offering preschool through secondary education. Last year, an orthopedic unit was added. Over the years, this missionary endeavor has gained worldwide enthusiasm and support, and now ND SatCom too has made a major contribution. The SKYWAN network will serve the purpose of monitoring the telemetry of the radio antenna towers. With this communication infrastructure, programs produced with regional content at the local communication center will be distributed in the states of Apurimac, Cusco, Madre de Dios, and Puno. The SKYWAN satellite network construction, commissioning, and continuous operation will be carried out exclusively by personnel who have not had any experience with such systems. This is possible without ND SatCom technicians due to the intuitive usability of SKYWAN; plus, Chris Welch’s dedicated team is up for this challenge. Nonetheless ND SatCom’s support experts will be available to assist as needed to ensure reliable operation of Diospi Suyana’s media services. ND SatCom is thus helping Diospi Suyana, a lighthouse project, to radiate its purpose for humanity and cooperation far beyond its location in the Peruvian district of Curahuasi. We thank Wladimir Bahury for his great job in the LATAM region (Peru) and the BU GOV/ENT management team, who played a major role in defining the business set-up and making the deal finally happen.